Stand-up paddleboarding is the new craze around towns with access to waterways, and being home for the summer, I thought I’d give it a go. In essence, all it really involves is standing very still on a fiberglass board and carefully propelling the board with a forceful dunk of a paddle into the water. This seemed problematic for two reasons: first, it required upper body strength, something I do not possess. While the rest of the yoga class balances sturdily on their forearms, bodies rigid with focus, my body becomes a clump of limbs on the floor, a very confused yet very intriguing blob that is not quite sure how it got there. Second, I have a hard time balancing. This includes anything from standing up in a boat to running on a level sidewalk. I fall down unprovoked and often. So the idea of standing on a board and paddling around the river – which is murky and hiding all sorts of sizable, webbed creatures in its depths – was not enticing at all. Kacey, a paragon of balance and upper body strength, had taken up paddle boarding a few months earlier and had fallen so in love that she’d purchased her own board and paddle. 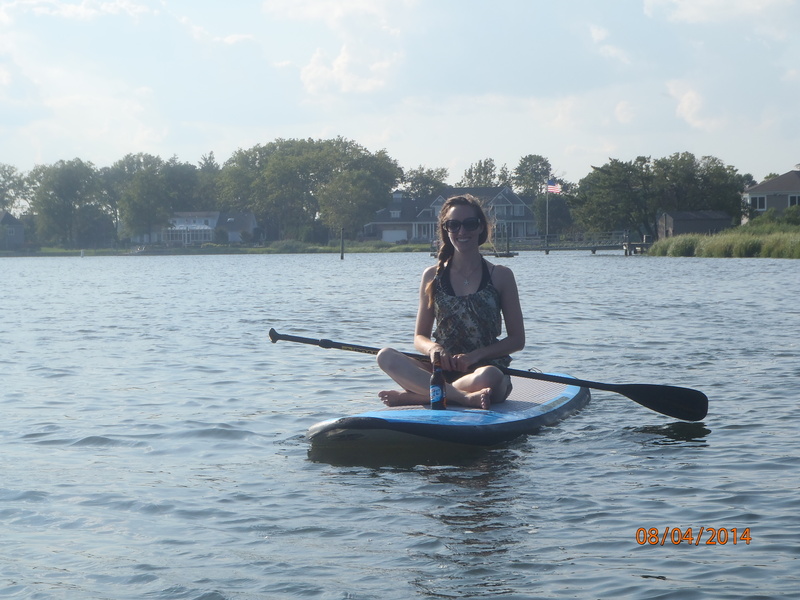 When bored with paddling, Kacey would take the board out and do yoga on it instead. Currently, she is working on a headstand. I went out for the first time with my sister on long foam boards we rented from a marina belonging to the upper echelon of society. 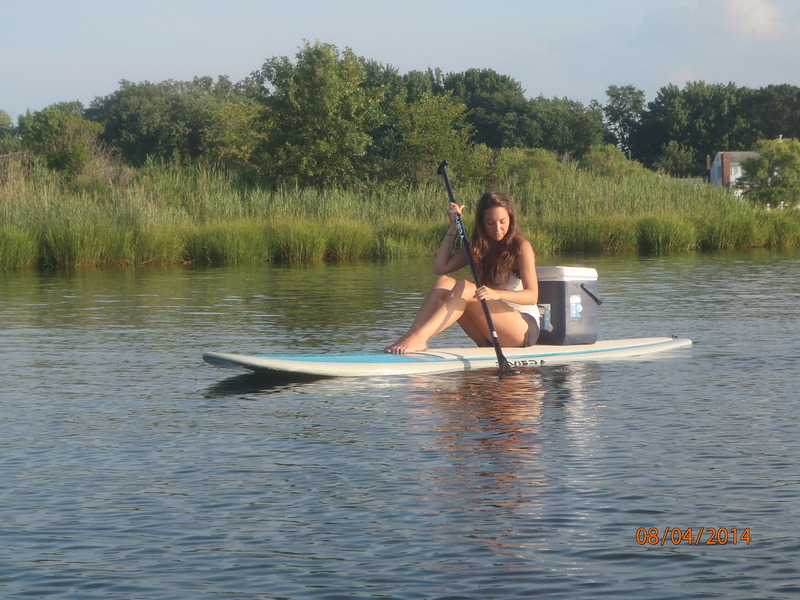 Allison, another picture of grace and stability, quickly paddled out of the marina and into the river. It took me much longer. My feet somehow rooted themselves to the board, frenzied talons gripping into the foam for fear of falling off. I hastily dipped the corner of my paddle into the water like one repeatedly sticking a finger into a pot of boiling water, at a speed that practically had me moving backwards. Allison calculated that it took us an hour to get out of the marina and eight minutes to get back in, although we were moving against the current at first. Having not fallen off the board, I decided this was a hobby I could invest in and rented a board a few weeks later with Kacey. This board was much larger and made of a sturdier, fiberglass material. It also had a stingray decal, which looked pretty cool, even though I was sure that sharks would notice the stingray from their hiding places deep in the river and swim up to attack me. Being an expert, Kacey hefted a large cooler filled with beers, ice, sandals, and our car keys onto the back of her board and I followed her out, carrying nothing. It was 4:00 in the afternoon. Our plan was to paddle out a ways down the river, then let the current carry us back to a pointy curve of riverbank where we could drift and watch the sunset before paddling home. This time, I felt much more confident. I’m not sure whether it was because I’d been out once already or because I had a cool stingray, but I felt less wobbly and more certain, my toes not digging desperately into the board. Kacey also showed me how to lengthen my paddle so I could dip it into the water more easily, a trick that might have been helpful my first time. One of the great things about SUP is that you get to see towns and bridges from unusual angles. Here are mansions you’ve driven by in your car, towering bridges you’ve traversed on a bicycle – and now you’re seeing them from the river. It’s like a secret back road without any traffic, providing a glimpse of that unseen part of town – the dark side of the moon. On the river, we were minor celebrities. Women in beach chairs at the ends of private docks waved and called out to us, cheering us on. Children fishing from their backyards waved and shouted excitedly about their catches. We drifted in the wake of jet skis and speed boats, and occasionally navigated tricky waters between towering white yachts and sailboats or under bridges through barely-visible fishing line. Floating and paddling, we spent hours chatting and sipping cold beers until it was time to catch the sunset. We headed back to the point of land, stopping briefly behind a pier so Kacey could relieve herself (a real dilemma as a woman on a paddleboard). We polished off the last of our beers in the red glow of the sunset, a spectacular show that dusted treetops, docks, boats, and the changing waves with gold. It was a good point. 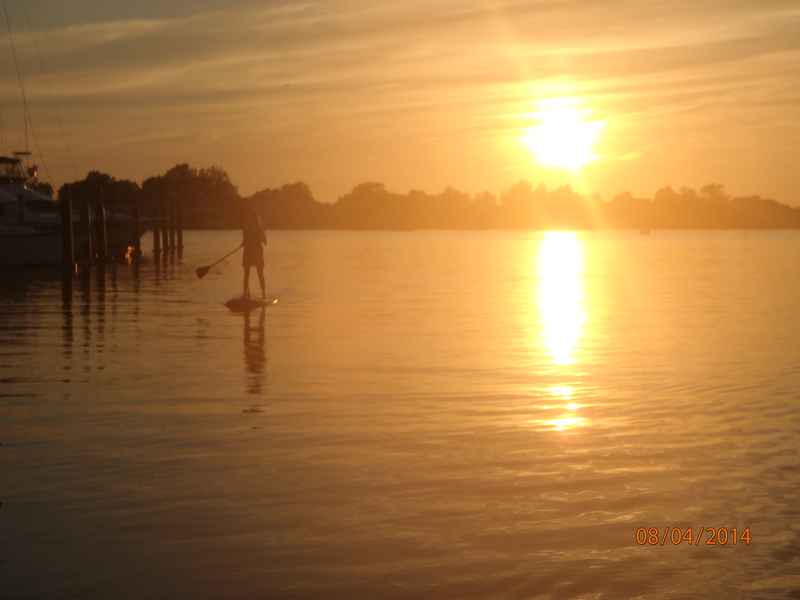 Paddleboards don’t come with lanterns, so we would become invisible to boats sailing into the harbors once the sun was gone. This wasn’t a pleasant thought, but I put it out of my mind. We had plenty of sunshine left, and were only around the corner. Or so we thought. A half an hour later, we found ourselves upriver and in a tiny cul-de-sac, surrounded by condominiums and certainly not the place we’d dropped the boards in hours earlier. Kacey knew the street we’d parked on and asked a man on his balcony, who pointed back the way we came. Kacey led the way, pausing to ask fishermen or homedwellers if we were on the right track. I followed along behind her, exerting all of my efforts yet still lagging. Too far behind to engage in conversation, I became lost in my thoughts. As the sun set and the sky darkened overhead, I thought of the countless times I’d swum in that same river when I was younger. And then, unbidden, came all of the thoughts I’d been trying not to think: newspaper headlines a few months ago stating that a thresher shark had been pulled out of the river just a few miles from where we were; Shark Week; the Matawan Man-Eater, the shark that inspired Peter Benchley to write Jaws. My beer buzz had worn off by now, the inky black sky reflected in the waves, a white moon rising. Yes, I was afraid of incoming boats, especially since I was last and it would be my screams Kacey heard as the boat mowed me down. But it was the image of a bull shark – the most aggressive and dangerous shark on the planet, the shark that kills in saltwater and brackish, the shark that swam up the Matawan River in 1916 – that kept me going, paddling furiously. Years of watching Animal Planet reminded me that predators always attack the slowest member of the herd, and in our herd of two, I was the slowest. Was Kacey even close enough to hear me scream? I forced myself to keep an eye on Kacey, mostly because it was so dark that it was feasible I might lose her, but also because if I looked down, I was sure I’d see a triangular fin cutting the surface of the water behind me. It didn’t help that every few minutes, some fish would leap out of the water, invisible in the dark, making a loud splash on my left or right. Suddenly, it was that much more important to stay standing on the board, something I hadn’t even thought about until that moment. We paddled onward, Kacey keeping an eye out for the cove, me watching Kacey on an imaginary episode of Shark Week in my head. When Kacey finally called out that we had to cross the river and we’d be there, I was ecstatic. Terrified – mid-river there are very few docks or piers to swim to if a shark knocks you in – but ecstatic. Somehow, after five hours of paddleboarding, we made it back to shore. We loaded our boards and drove back to Kacey’s for sushi and much-needed glasses of wine. What we got instead were numerous messages from frantic family members, wondering where we were. In fact, Kacey’s mother had phoned her boyfriend who was out of the state, as well as the sister of the girl whose boyfriend owned the shop I’d rented the boards from. Massively irritated, we phoned our relatives back. And it was, to an extent, but I couldn’t help but find some small comfort in knowing that if we’d been stranded in the river, surrounded by sharks or boats or water-prone serial killers, someone would’ve come for us. Still, it’s slightly embarrassing, especially since we’d completed our journey early in August, and we still fielded baffled questions and endless taunts right up until I left for Cairo at the end of the month. And despite all of this, despite the fact that I woke up the following morning with a strange and aggressive case of bronchitis, I look back at my summer and count that as one of the best nights I had while I was home.